A thoughtfully-designed corporate giving program produces the perfect storm of deep impact, brand trust, and constituent engagement and retention. Making a marked difference in your community takes time and resources. As a company that cares about people and strategically deploys its capital, you should be net positive when you invest in your community. We are the perfect partner to journey with because we are marketing and systems gurus with transformation-level experience in the realm of social and personal impact. "What’s been wonderful about working with Kristy is that she brings both a wisdom about business and a deep understanding of the needs and wants of charities." Strategic gifts of products, services, and profits can transform your business and the relationship you have with all your constituents. As a company of any size, in any industry, and at any stage in the development of your giving program (including well-established), you can retain us in Bend, Oregon or beyond to evaluate and optimize your entire philanthropic picture for marketing, sales, and human resources returns. When you don’t take a holistic, strategic approach to philanthropy, you run the risk of being very generous with very little return to your company or your community. When companies give, everyone wins. Giving strategically will not only increase your impact in your community, but will help you acquire, engage, and retain customers and employees. With a modest investment, we can provide tangible results for your business and for your community. We can also help you say "no thank you" to opportunities that aren't a good fit for your priorities and goals by saying "Yes, Yes, Yes!" to giving that truly meets your needs and produces a wicked visible return. 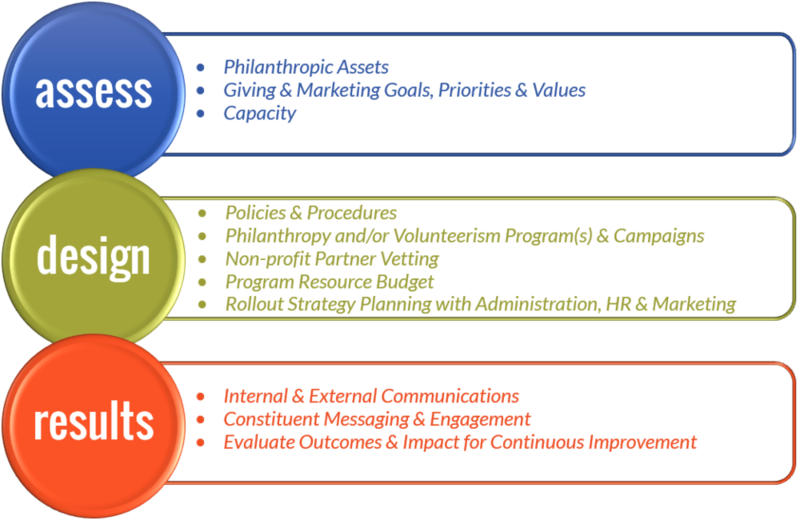 You can retain us to walk your company through our complete process, or to simply evaluate or to craft a specific program, campaign, or system for you, such as employee matching gifts, sponsorship, employee giving committees, non-profit partner vetting, employee volunteer programs and pretty much anything else related to your philanthropic efforts. We also offer training for your staff or administration on giving and community relations. "This was difficult for me because it seemed to go against my world view as far as giving was concerned. I felt giving needed to be purely from the heart and without much thought of any benefit that you could get out of it. What I came to realize through my work with Kristy was that, in truth, any giving from the company had to be strategic for everyone's benefit. Giving from my personal income can be purely from the heart and without strategy, but as far as giving from the company, it had to be strategic to keep in line with our goals as a company and ultimately to keep us healthy long term."